Looking into the cobbles rapidly illustrates (additional to the surface features) that the common pressure dissolution and tectonics explanation having been preached by geologists for decades has not any scientific basis. Fig. 1. 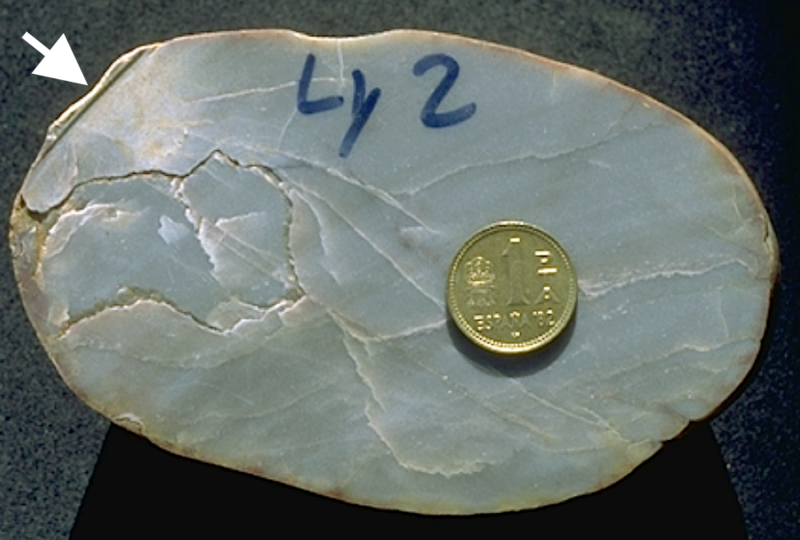 Quartzite cobble cut through the center of a crater (arrow). Note the diverging concussion (Hertzian) fractures and the white halo below the depression resulting from intense micro-fracturing. Fig. 2. Another quartzite cobble cut through the centers of three craters. Note the crater-related cracks and the light-colored halos below the depressions resulting from intense micro-fracturing. Fig. 3. One more quartzite cobble cut through the centers of two craters. Note the peculiar cracks related with the collisions and similar to the cracks in Fig. 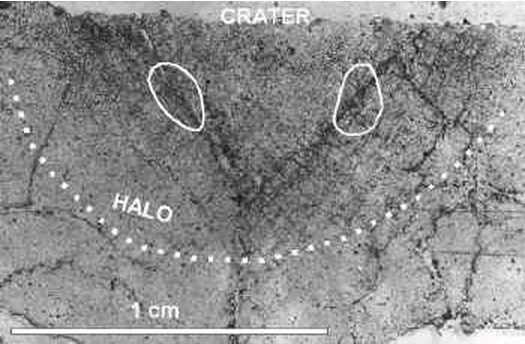 2, and the light-colored halos below the depressions resulting from intense micro-fracturing. Fig. 4. Spallation occurs also on a microscopic scale. 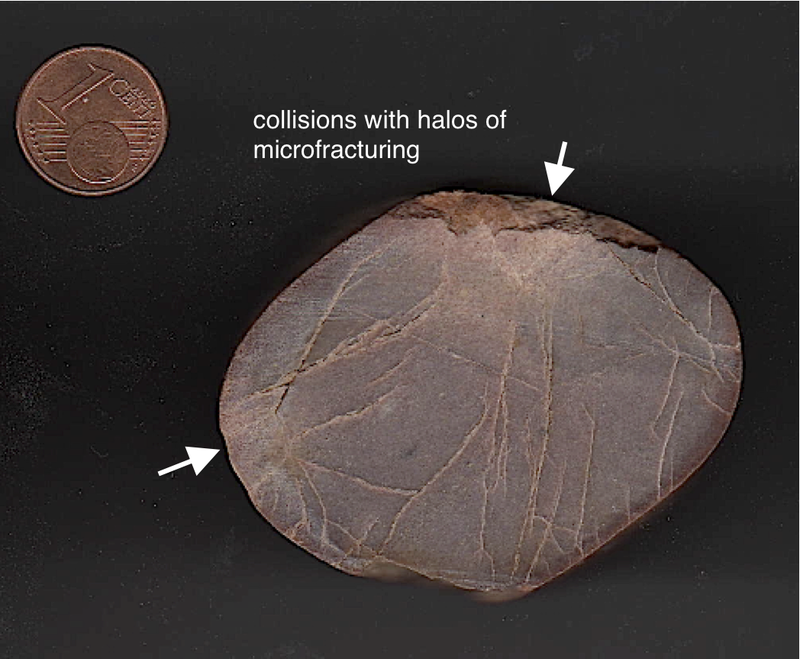 In the photomicrograph (plane light), a spall is completely (2-D) detached from a quarzite grain in the Buntsandstein conglomerate, and more open tensile spallation fractures are cutting through the clasts. The image shows pure tension without contact between the neighboring grains (in 2-D). The matrix is opaque from iron-hydroxide. Field width 9 mm. Fig. 5. 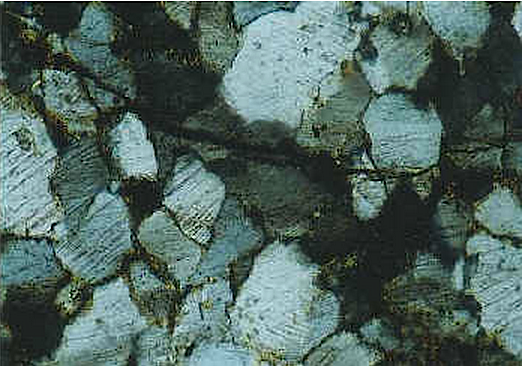 Cross-sections of millimeter-sized craters in Buntsandstein quartzite cobbles, drawn from photomicrographs. Note the central mounds and the dinstinct open fissures below the crater floor. 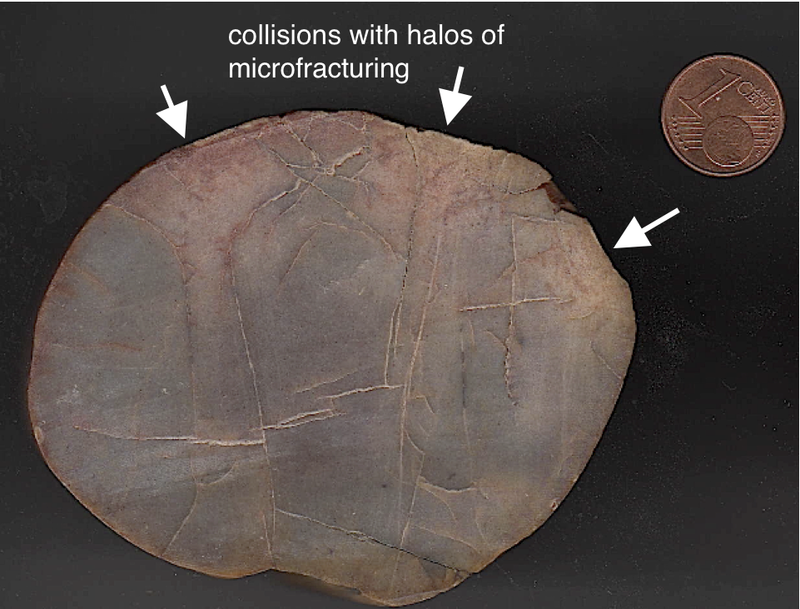 Both are in proof of tensile stress (from spallation) and exclude pressure dissolution by overburden and tectonic compression, the more so as no material is dissolved, removed, and precipitated below the craters. Pressure dissolution results in an increase of compaction and a decrease in porosity. Evidently, we are observing just the opposite. 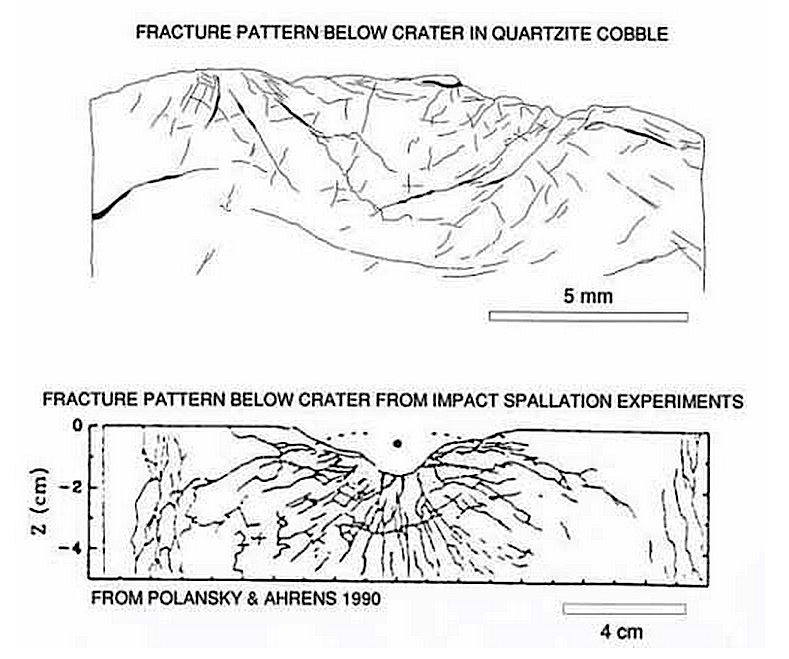 – The cross sections and the delineation of the fractures show that for at least part of the central mound craters Hertzian fracturing appears to be combined with shock spallation cratering (see the discussion on the Hertz fracturing HERE, and Fig.6). Fig. 6. 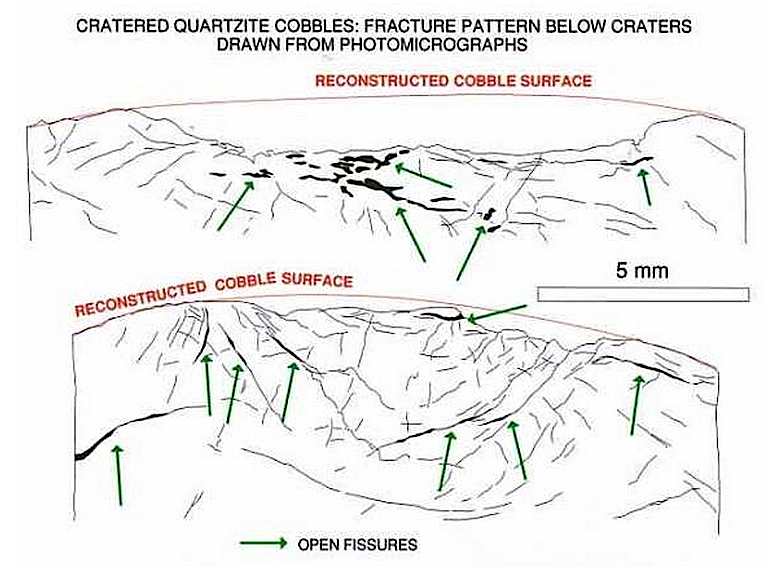 Similar fracture pattern below a crater in Buntsandstein quartzite cobble and a crater produced in impact spallation experiments (gabbro target). Fig. 7. Photomicrograph (plane polarized light) of the halo below a crater in Buntsandstein quartzite cobble. The halo results from intense intergranular micro-facturing and intragranular planar deformation features. Distinct PDF concentrations are encircled. Fig. 8. Photomicrograph (crossed nicols) taken from the encircled area in Fig. 7. 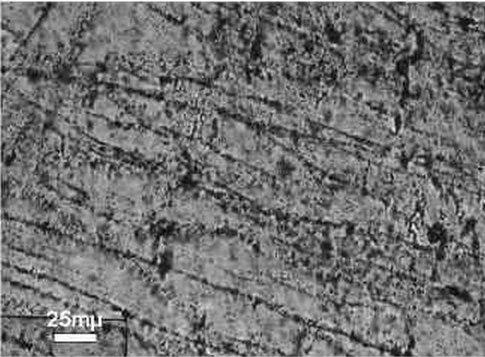 Decorated intragranular PDFs of varying orientation and decorated intergranular, subparallel micro-fractures (SSW – NNE trending) in quartz are conspicuous. It is important to point to the abundant PDFs in quartz from the quartzite cobbles indicating considerable shock intensities if we apply the common shock criteria. We must not forget that the Buntsandstein deposits exposing the heavily deformed quartzite cobbles are way beyond the Azuara and Rubielos de la Cérida impact structures as the source for the shock damage. According to textbook knowledge PDFs, particularly in such an accumulation and intensity, should not develop at such a distance. This may well hold true for linearity of shock propagation, but shock is a strongly non-linear process and may have its effects in places. We suggest that the strong impedance contrast between the very hard and dense quartzite cobbles and the sandy matrix with internal shock wave reflections and reverberations could have led to escalating shock intensities enabling the remarkable PDF formation. – A comparable situation is found with in part unusually abundant and high shock effects in silicate cobbles from craters in the Chiemgau meteorite impact strewn field in Southeastern Germany. A respective discussion also focuses on an anomalous shock metamorphism in cobbles and boulders embedded in a soft matrix, and reports may be clicked HERE and HERE. We conclude that obviously textbooks (and the traditional impact research) do not consider the complete spectrum of PDF shock metamorphism. Fig. 9. 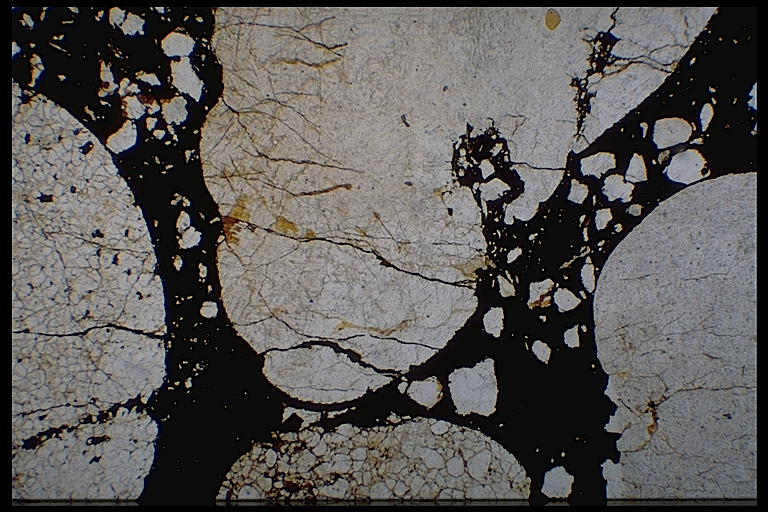 Photomicrograph (by courtesy of Inka Siegert) of subparallel decorated micro-fractures in Buntsandstein quartzite cobble. The fresh-water fluid inclusions have been analysed thermomicrometrically establishing hydrothermal conditions at about 200°C trapping temperatures and pressures between 0.11 and 0.26 GPa. A similar hydrothermal signature has been reported for the Siljan Ring impact structure (Komor et al. 1988; see I.Siegert, 1997).